"This is a dry Jamaican Jerk seasoning I use mostly on grilled chicken! You may want to give some away to friends because this recipe makes a lot! 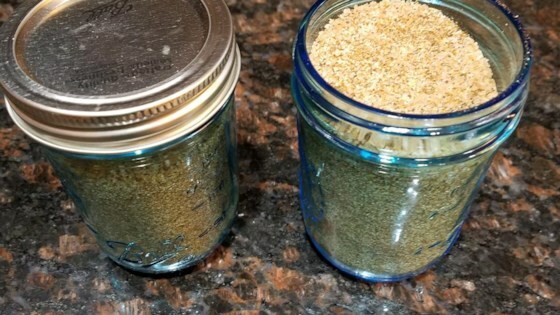 Use it as a dry rub on grilled chicken, fish, steak, or just about anything else." Place allspice, salt, garlic powder, sugar, chipotle powder, cloves, thyme, black pepper, cayenne pepper, and cinnamon into a very large bowl. Mix together until well blended. Store in airtight containers. To use, rub spice mix onto the meat of your choice, about 1 1/2 teaspoons per serving. For best results, marinate for at least an hour to allow the flavors of the rub to penetrate the meat. This was way too hot for me and I love spicy food. Next time, I will cut the cayenne in half. This rub has decent flavor but it is not Jamaican Jerk. I've worked alongside a true Jamaican who would cook for us all the time and this rub does not taste like Jerk anything. Wow, this is awesome stuff. Used it to make a barbecue pork in a crock pot, it was so delicious.